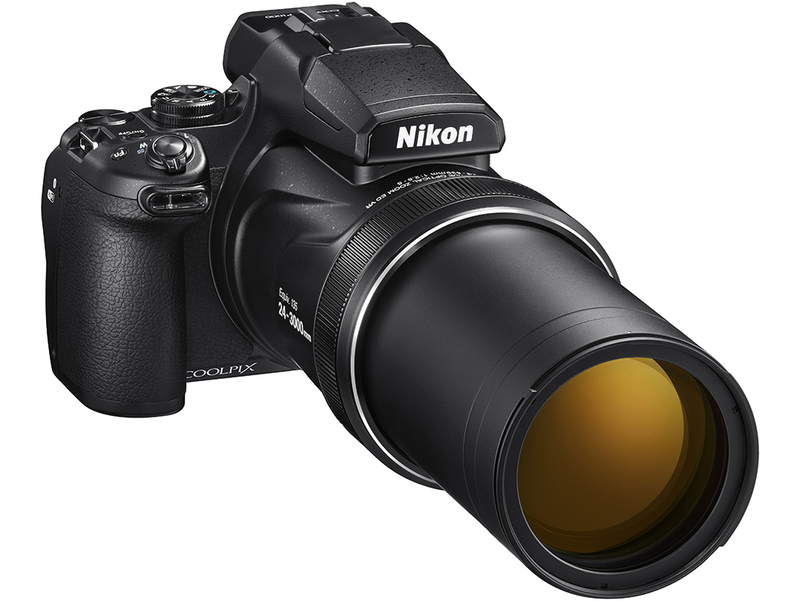 If you wanted one camera that can literally capture everything, I don't think you can go wrong with the Nikon COOLPIX P1000, especially once you find out it has an unmatched 24-3000mm equivalent lens. You read that right, this one goes all the way to 3000mm, surpassing its already impressive predecessor by a cool 1000mm. 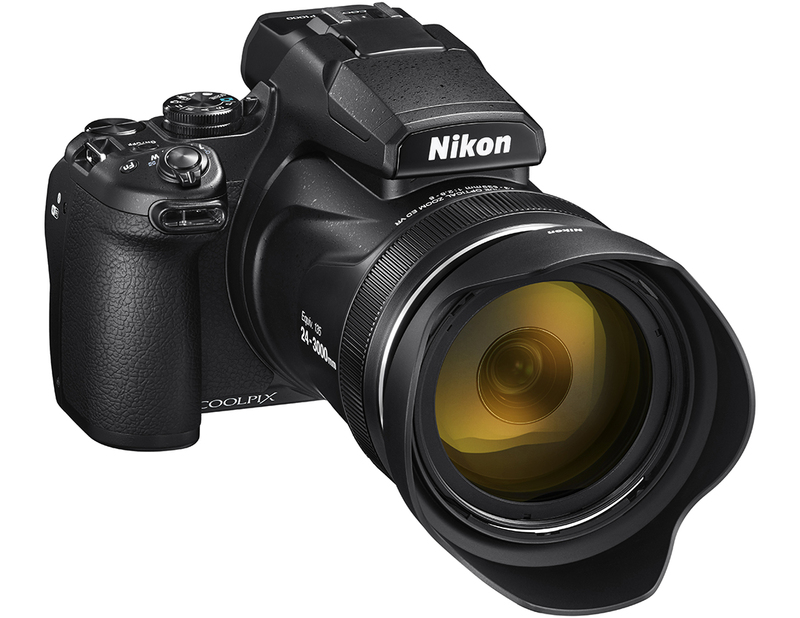 Miraculously, Nikon has kept the handholdable form factor of this long zoom point-and-shoot camera, and its more DSLR-like form factor provides shooters with a variety of physical controls that make it easy to use. We really need to focus on that lens, as there isn't anything else on the market that can give you anything close. It is a 125x optical zoom NIKKOR Super ED lens and features five stops of Dual Detect Optical VR image stabilization to help you out when you start reaching out to those far out focal lengths. The lens barrel also features a control ring for a more tactile shooting experience when controlling certain settings and there is a tele/wide zoom switch for easy, intuitive control. And, with this long a lens there are some obvious subjects, such as wildlife and astrophotography, which is why Nikon has added some dedicated Bird and Moon modes to help capture more stunning photos. 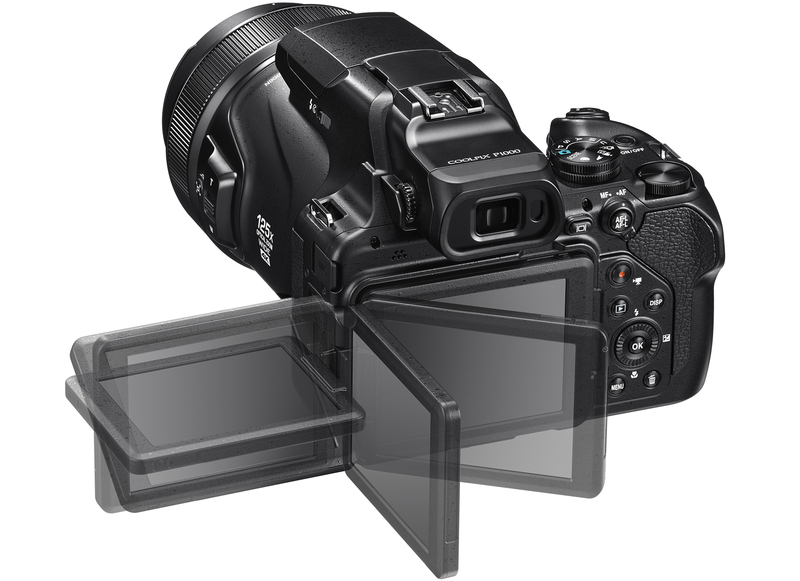 As a versatile basically all-in-one camera option, video shooters and documentarians will be pleased with the introduction of UHD 4K video at 30 or 25 fps. For users looking for the best quality, the P1000 does feature clean HDMI output and has a 3.5mm mic input for cleaner audio. This is possible with EXPEED processing in combination with the 16MP BSI CMOS sensor packed into the camera. Also, the combination here enables a Dynamic Fine Zoom setting for achieving a 6000mm equivalent zoom length as well as NRW raw support. With a great lens comes a little bit of a compromise, the P1000 is one of the larger point-and-shoot models out there. This does lend itself nicely to operation as there are plenty of customizable dials and buttons around the body. Also, the larger grip is more comfortable considering the overall size. And for composing images, the rear of the camera offers both an eye-level 0.39" 2.36m-dot OLED EVF and a 3.2" 921k-dot vari-angle LCD. Users looking for a camera with manual controls will not be disappointed here. For wireless connectivity, the camera offers built-in Wi-Fi and Bluetooth. Are you impressed with the 24-3000mm equivalent lens on the P1000? What would you do with that kind of zoom? Let us know in the Comments section below! Did Nikon correct the flaws of the P900. Did they move the tripod hole closer to the center in the P1000. Also, did they make the four little screws that hold it in more secure so that the camera doesn't fall off the tripod leaving behind pieces of the camera? I am thinking about taking this on a Safari to catch the big animals that we can't get close to. Then I will take it to Antarctica to to shoot whales, penguins and seals from a ship, where we can't get close enough for a lens with less reach. is there an ac jack, what is the battery life when shooting video? How does the picture quality compare to a normal 1200mm lense? Is there any type of manual focus? Can you attach a haze filter? Yes, it accepts 77 mm screw-on filters. Would this be compatible with an SB-600 external flash? Any chance it has remote tethering via USB? What's causing the frame stutter at 3:38? Is that shot of the boat converted from 30p to 24p? Could that be it? 3000mm is impressive - but it says 3000 equivalent? What does that mean? Digital zoom is far from equivalent to optical. What is the actual optical zoom? Pretty sure it means 35mm equivilant and that it is actually an optical zoom. It means 35mm equivalent. It has nothing to do with digital zoom. Is the P1000 compatible with Ronin-S? I can’t wat to get my hands on this and prove flat earth to my friends! Does this camera have custom programmable buttons to create back button focus, or does it have that feature already? I see the P1000 has a hot shoe on top. Are you able to connect an external mic to this camera? My P900 is not able and only shoots in JPEG no RAW option. You can connect an external mic! There is a 3.5mm jack on the side. What selections for Jpeg? The last version only had fine and not super fine. Also was not particularly sharp when zoomed. I have the P900. Just curious if the sensor on this one is larger than the small 1/2.3" CMOS of the P900? my photos on the p900 are not as sharp as say, the Panasonic Lumix DMC-FZ1000 I've had since 2014 ( 1"-type, 20.1 megapixel CMOS sensor ) and refuse to give up until a better superzoom with large sensor and great optics comes along. Let’s not lose sight of the fact that this is a COOLPIX. It’s a very high end point and shoot for someone that wants good photos while not necessitating the skill set of a photographer. For smeone that wants more than your phone can give you, this just might be the tool for you. I have some Nikon bodies and 8 lenses to get almost any shot I want, but I always have a COOLPIX handy for a ‘snapshot’. I can’t wait to get my hands on this P1000. It weighs approx. 3.12 lb. How does this lens compare with other Nikon lenses? Can you show some actual pictures take with the camera and that have not been cooked in Post processin? At the moment we don't have a production sample for review, so we don't have any raw images to share. Stay tuned to Explora though! Se conoce el diámetro de rosca de los filtros para el objetivo?. I have no doubts about the capabilities of the lens, but with the limitations imposed by the small sensor (smaller than 4/3, I assume), who is this camera for? Those who value image quality (for which one needs, among other things, a good dynamic range and relatively low noise, neither of which a small sensor can deliver) will not go for it. Those who don't care about image quality will simply upgrade to the next smartphone model. Nikon once stood for photographic greatness. They should be focused on developing large sensor mirrorless systems, which is the present, and future, of photographic greatness. Sony, Fuji and Leica understood this. I wonder whether any of the others will still be in business a few years from now. You might be surprised at how good the pictures can be. I was looking for my first digital camera last year and decided on the P900 for the flexibility it would give without the expense of needing multiple lenses. Yes, there is a trade off, but even some professionals like it for the fact that you can get some really great tight shots of your subject from so far away when a DSLR just won’t reach even with the longest focal length lenses. I took the P900 with me to South Africa last month and got some beautiful wildlife shots that other people with professional cameras just never could have captured, and that was with a max 2000mm equivalent focal length. The added 1000mm from the P1000 could enable even greater possibilities and may be a good option for serious photographers who want to supplement their DSLR with a camera that will allow them to get those shots that would normally be too far away. You could hardly differentiate between a zebra and a leopard with a 3000 mm zoom with such a small sensor. I would rather not have worthless digitally zoomed photographs. Thanks Janis. Yours is the feedback I am looking for. I love my iPhone 7+ with my Moment 2x Tele lens. It does great landscapes at a distance, but just cannot do optical zoom enough to photograph a whale at 300 yards. How far away do you think you can get a good shot at a whale or a lion? It sounds like you think it is worth double the price and weight to upgrade from the 900 to the 1000. What would I do.....Sell all my other lenses! That's all fantastic, but what's the aperture range? Nikon states this is an f/2.8-8 lens. So pretty dramatic shift for a fairly dramatic zoom. If you click on the link above, the Specs show f2.8-8.